Bri Wallis earned All American Academic honors from the National Interscholastic Swimming Coaches Association of America in 2016-2017. 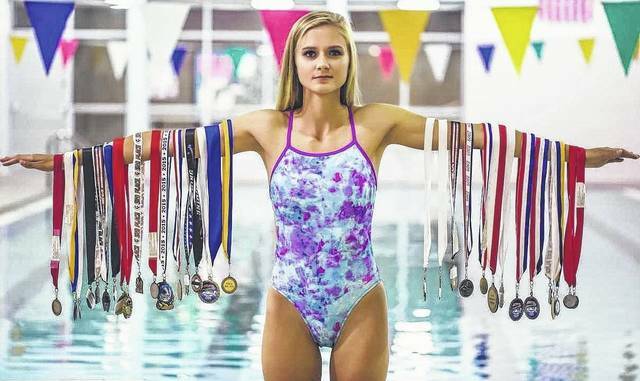 Wallis poses for one of her senior pictures with her numerous swimming medals. GALION — Galion High School’s class of 2017 valedictorian Bri Wallis was recently awarded membership into the National Interscholastic Swimming Coaches Association of America’s All-America Interscholastic Academic Team. The award from the NIASCA, founded in 1934, was presented to Wallis by Galion’s head swimming coach Ted Temple and Galion High School Principal Ron Williams. Wallis’ talent in the pool originally caught Temple’s eye when she was in middle school and were continuously recognized by the coach in all four years that Wallis attended and competed for the Galion Lady Tigers. Wallis not only earned the right to be named Galion’s valedictorian but has also completed enough post-secondary classes to equate to roughly two years of college education. Wallis plans to attend Otterbein University in Westerville where she is planning a double major in microbiology and biochemistry. She also has also been accepted into the medical school department at Ohio University, along with just nine other students and did so at just 17 years of age. To date, Wallis has also earned more than $110,000 in college scholarship money. Congratulations to Bri on a well-deserved honor and best of luck in your future academic endeavors! 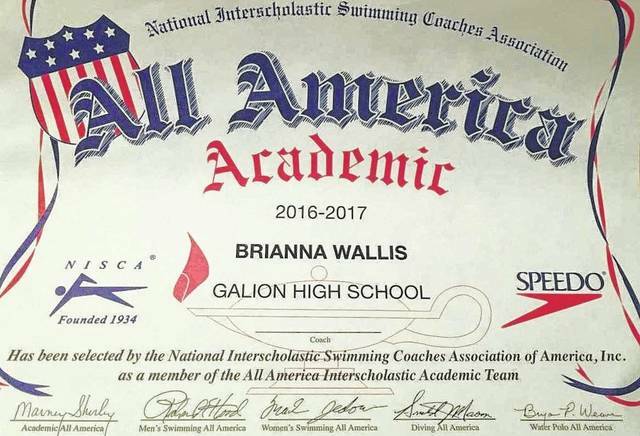 https://www.galioninquirer.com/wp-content/uploads/sites/38/2017/06/web1_Wallis.jpgBri Wallis earned All American Academic honors from the National Interscholastic Swimming Coaches Association of America in 2016-2017.
https://www.galioninquirer.com/wp-content/uploads/sites/38/2017/06/web1_Wallis-2.jpgWallis poses for one of her senior pictures with her numerous swimming medals.